Tea is the most widely consumed beverage in the world taking only second place to water. Over three million tonnes are grown annually for tea consumers worldwide. The tea plant is an evergreen shrub that provides us with black, white, yellow, and green tea as well as oolong and pu-erh tea. 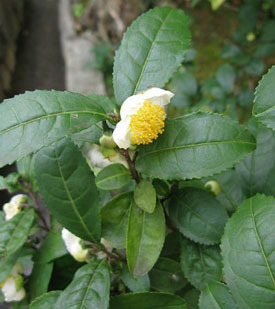 It is the leaves and leaf buds that are commonly used to produce the teas we enjoy. The difference in taste is how they are processed and how long the leaves are left on the shrub before harvesting. Interestingly, in Tanzania, tea plants have been noted to escape from cultivation in areas of Amani and around Mount Kilimanjaro and are considered to be invasive in parts of the Usambara mountains. The tea plant can live anywhere between 30 and 50 years. Distinguishing Features: Although the tea plant is most often referred to as being an evergreen shrub, when left in the wild undisturbed it grows into a tree with a bowl-shaped canopy. The bark is rough and typically grey. The tea plant branches with alternate elliptical leaves that are leathery in texture. Flowers: Flower blossoms are white, are quite fragrant, grow on their own or they appear in clusters of 2-4 together on short branchlets in the leaf axils. They grow up to 4cm in diametre with five sepals and can have 5-9 petals. The flowers are hermaphrodite (have both male and female organs) and are pollinated by bees. Fields of Nutrition has medicinal benefits and vitamin/mineral content of Tea Plant. 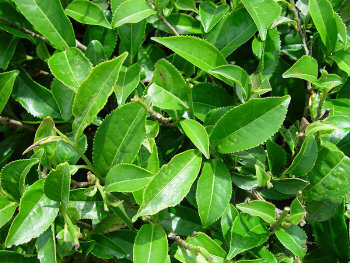 Leaves: The tea plant’s leaves are dark green with serrated edges, and a pointed tip. They are somewhat oval in shape and alternate. Most leaves tend to have a hairy underside and they usually grow to between 5 and 10 centimetres in length. Height: This shrub can reach heights up to 9 metres (30’) although for cultivation purposes they are pruned to about 1 -2 metre. 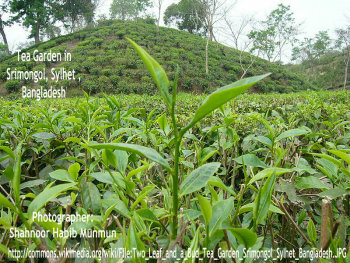 Habitat: The common tea plant prefers shaded areas at (typically) elevations of 2100 to 2700 metres and at forest edges. It grows in many parts of Asia, Eastern Africa and Argentina. It prefers light sandy soils and medium loamy soils that are well-drained. The tea plant is also cultivated in some areas of the U.S. Edible parts: Tea leaves can be eaten and in some cases they are recommended to be eaten as opposed to making tea because the nutrient content is much higher when consumed as food. The flowers are edible as well. A clear golden-yellow edible oil resembling sasanqua oil is obtained from the seed (must be refined before ingested).